National guard units seeking to confiscate a cache of recently banned assault weapons were ambushed on April 19th by elements of a Para-military extremist faction. Military and law enforcement sources estimate that 72 were killed and more than 200 injured before government forces were compelled to withdraw. Did Peter O’Toole Cause All the Problems in the Middle-East? The following is another guest article by Dan McNeil of Cartridge World on South Campbell in Springfield MO. This article may be intense for some however I found it a interesting read and should make you think. Peter O’Toole, who stars in one of my favorite movies, A Lion in Winter, (a sheer pleasure to watch) passed away a couple of years back. Alongside Katherine Hepburn, O’toole plays Henry II, a fading and cruel English king who torments and divides his three scheming sons by dangling succession to the throne in front of each of them. 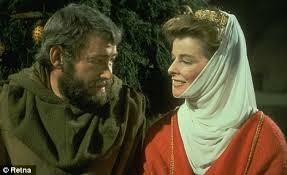 Hepburn plays his queen, the unloved Eleanor of Aquitaine, who hopes to escape her tower exile by murdering Richard with the help of their sons. Taking place at Christmas, this story of a supremely dysfunctional family has a bitingly funny script that is decidedly un-Christmassy. What shall we hang? The holly or each other? Thomas Jefferson and I share the same birthday. Sometimes I think I have done a lot in life, then I realize what he did and I am humbled. Here is a list of some of his accomplishments, without today’s technology! At 5, began studying under his cousin’s tutor. I played in dirt. At 9, studied Latin, Greek and French. I played baseball. At 14, studied classical literature and additional languages. I quit playing baseball. At 16, entered the College of William and Mary. I found my first girlfriend. While on my kick of security I came across this on my hard drive, I really don’t remember where I got it from but it is true.